These fluffy, white puppies are just too cute. 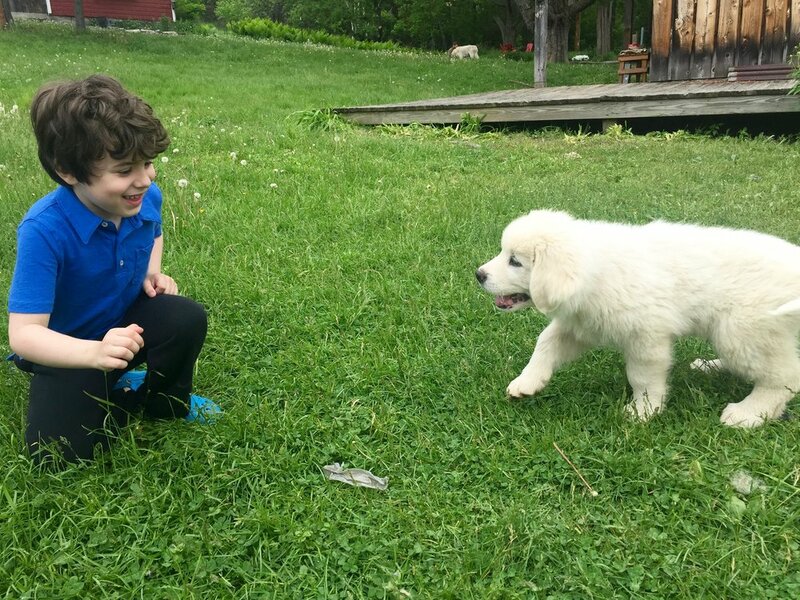 We mentioned in our last Lime Kiln Farm post that the farm's Italian Maremma sheepdogs, Teo and Pippa, had welcomed 8 babies. At the time of our visit, the puppies were 9 weeks old and already weighing in around 30 pounds. They're expected to weigh 100 pounds when they're full grown. Just look at that giant puppy paw! As we drove into Lime Kiln Farm's driveway, multiple signs warned us about their working dogs. And it's true, the puppies were EVERYWHERE! And they're like cuddly, fluffy little snowballs of joy. 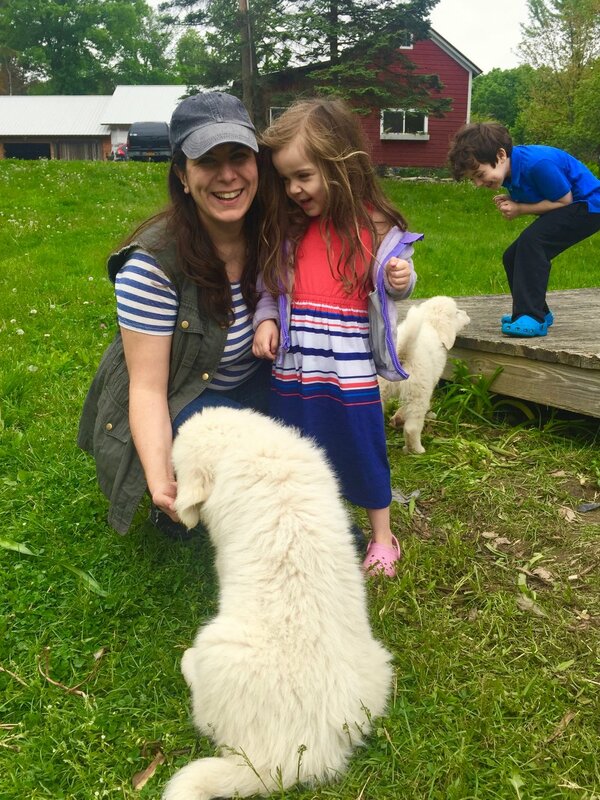 My 7-year-old was jumping for joy, and the puppies were so friendly and sweet that my 3-year-old decided that she wasn't afraid of dogs anymore. According to the Lime Kiln Farm site, "If you have a working farm and you need to protect your animals (sheep, goats, cows, llamas, etc.) from predators (wolves, coyotes, etc.) this is your dog. He/she takes his/her job seriously: unknown animals or humans will have a hard time approaching your herd or flock." Unfortunately for us, the site also says, "This dog needs: space and independence. If you live in an apartment don't get one!" I wish our tiny Brooklyn backyard could accommodate one of this special and adorable dogs! Some of the puppies are still up for adoption, so if you're in the area, you can pet them while you buy some local cheese at the Lime Kiln Farm store. Lime Kiln Farm is located at 1512, 523 Lime Kiln Road, West Coxsackie, NY. Since the farmers are often busy in the field, it's always worth calling or texting (518) 350-9494 before you stop by. Typical hours are 9am-1pm and 4pm-7pm on Friday, Saturday, and Sunday; or Monday through Thursday by appointment.